Barbara had gone to bed late and really didn’t feel like getting up this morning, but her dog had other ideas. So she reluctantly got out of bed to let the dog out, and like every other clear morning this month, she fired up the telescope and CCD and pointed toward U Scorpii. When the first image appeared on her computer there was a huge over exposed star right in the middle of the field. Barbara couldn’t believe her eyes. In fact, she didn’t believe her eyes. Just yesterday she had measured U Sco at 18.2V. She quickly took another much shorter exposure, double-checked the position, “and that’s when I started to get excited”, she said. 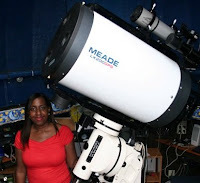 Dr. Barbara Harris, an amateur astronomer, had been monitoring the recurrent nova, U Sco, for months, in anticipation of a rare eruption that had been predicted by Dr. Bradley Schaefer, an astronomer at Louisiana State University. Barbara and many other observers, participating in a campaign coordinated by the American Association of Variable Star Observers (AAVSO) had begun monitoring U Sco in February 2009. Now on a clear, clam morning in Florida, the moment had arrived! Barb submitted her observation to AAVSO, looked up Brad’s telephone number, and then thought to herself, “Let me take one more image just to be sure. I don’t want to call him this early and wake him up if I’m not sure.” At this point, it was about 5:30 AM EST. So she took another image, calibrated and measured, removed all doubt from her mind, and called Brad Schaefer. Just on the other side of Orlando, Shawn Dvorak was just waking up to go to the gym. His telescope had been running all night taking data on several variable stars he was monitoring for AAVSO. Shawn had also begun monitoring U Sco again in January, as it peeked out from behind the Sun. It was usually his last observation in the morning, rising high enough to observe just before dawn. “I almost didn't observe it this morning since I was planning to go to the gym. I'm glad I did!” Shawn wasn’t quite awake yet, and when the first CCD image came up, he thought to himself, “whoa, I'm pointing at the wrong field, there's no star that bright here”. Shawn said, “Barbara Harris spotted the outburst about an hour earlier but I hadn't heard about it yet, so it was quite a surprise to me when I saw this ‘new’ star”. Thinking the telescope had somehow missed the target; he re-imaged the field to convince himself. He then took a series of shorter exposures, so the erupting 8th magnitude star wouldn’t be saturated on the CCD, and kept taking them for the next fifteen minutes as dawn quickly approached. About this time, the phone rang in Baton Rouge, Louisiana, and half-awake, Brad Schaefer lifted the phone to his ear. It was Barbara Harris, telling him U Scorpii was in outburst. “ He let out a scream and said thank you, thank you! I’ll start notifying everyone right away”, Barb recalled. Dr. Schaefer has been studying recurrent novae for years, collecting a large database of observations of all the known recurrent novae. His bold prediction that U Sco was going to erupt in 2009.3 plus or minus one year, was the basis for the intensive monitoring campaign by the AAVSO, and was widely publicized as well as published in his recent paper, ‘Comprehensive Photometric Histories of All Known Recurrent Novae’. 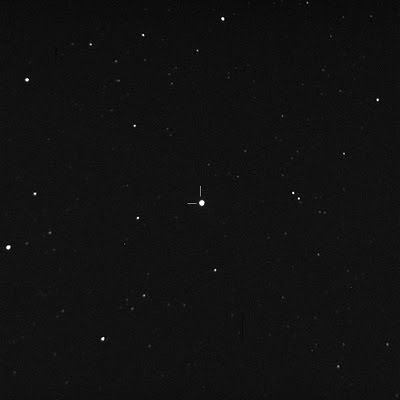 As U Sco approached conjunction with the Sun in the fall of 2009 and still hadn’t gone into outburst, astronomers everywhere started to get anxious. When it erupts, U Sco goes from minimum to maximum, then to one magnitude below peak, in under one day. This makes responding to the first sign of an outburst, and pointing large earth and space-based telescopes in time to cover the early parts of an eruption, a daunting task. At 6AM EST, Dr. Schaefer was on the phone and emailing people to notify observatories and space telescopes the moment had finally come. At 6:15 AM EST, Dr. Matthew Templeton, observing campaign coordinator for the AAVSO, was just stepping out of the shower when he noticed a voice mail on his phone. Before his hair was dry, a confirmation of the outburst from Shawn Dvorak had been submitted to AAVSO. Matt swung into action, and by 6:45 the first ‘AAVSO Special Notice’ had been sent, alerting observers around the world to begin observing the long anticipated eruption of U Sco. At 1:30 PM, six hours after Barbara Harris had first detected the outburst, the Rossi X-Ray Timing Explorer (RXTE) and the INTREGAL (INTErnational Gamma-Ray Astrophysics Laboratory) satellites were observing U Sco in x-rays and gamma rays. Observations from Hawaii and New Zealand were reported and the international campaign to observe U Sco in outburst had begun in earnest. Over the next several months, astronomers will be monitoring the progress of this outburst at nearly all wavelengths of light from radio waves to X-rays using ground-based telescopes and space-borne observatories. Dr. Arne Henden, Director of the AAVSO, commented, "This again shows the real advantage of the worldwide distribution of amateur astronomers for detecting transient events like this. Harris and Dvorak could watch U Sco rise over the Atlantic, hours before professional astronomers in the Western U.S. would have a chance. Then, because of the winter weather for most U.S. professional observatories, amateurs continued monitoring U Sco from New Zealand and Australia, catching the important first hours of the outburst." Just think; astronomers may have missed the beginning of the eruption entirely if Shawn had decided to go to the gym, or Barb’s dog hadn’t barked and gotten her out of bed. “My dog has been getting cookies and anything he wants all day”, said Barb. The progress of the U Scorpii outburst can be followed via the AAVSO, who are maintaining a web page devoted to the event, and anyone can view observational data as they are submitted in real time through the AAVSO website. at matthewt@aavso.org or via telephone at +1 (617) 354-0484.